Rain Man can count toothpicks. I can spot Auburn logos. So big ups to anyone who can find the Auburn tag and / or sticker referenced in this 1985 Plainsman issue, because I couldn’t — not as a kid when I wasn’t looking, not now when I am. 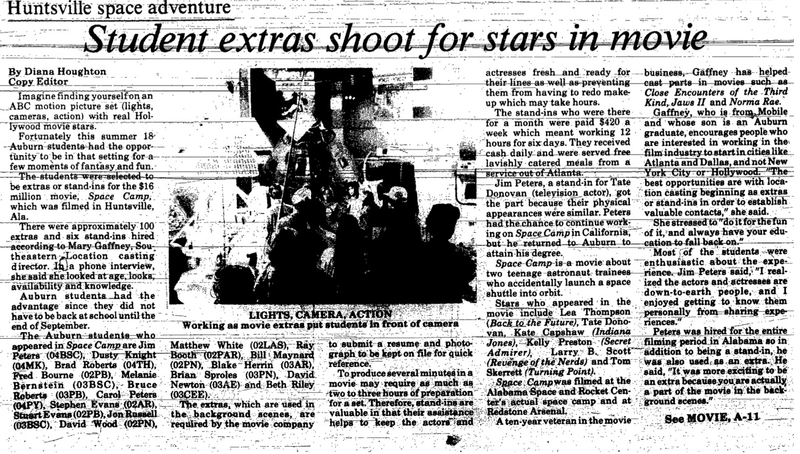 It’s supposed to be on a 1973 Monte Carlo owned by Dusty Knight, one of 18 Auburn students cast as extras and stand-ins for 1986’s classic Goonies-meets-Apollo 13 flick SpaceCamp, filmed on location at the Space and Rocket Center in Huntsville, and starring a young Joaquin “Leaf” Phenix. 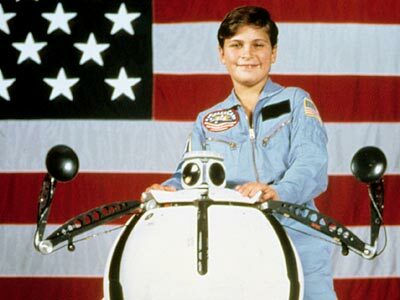 The plot (slightly different than the Plainsman’s synopsis): A poor man’s Johnny-5 suffers a seizure and somehow establishes a telepathic connection with a talking NASA super commuter which accidentally launches into orbit Steven Spielberg’s wife and a rag-tag group of gum-chewing teenage Space Campers (Leah Thompson, Kelly Preston, Tate Donovan and Joaquin — seriously, they never stop chewing gum) who are somehow allowed to board the Space Shuttle Atlantis for an engine test. From there, it’s pretty much Apollo 13. I suppose I had a lot less disbelief to suspend in 1986, because I really dug it back then. Speaking of suspending disbelief, perhaps my understanding of the stand-in’s art is totally wrong, but why was an Auburn coed (Melanie Bernstein) selected to stand in for an 11-year-old Joaquin in full-blown awkward stage? I know that the last line of Jeremy Henderson’s article said “don’t answer that,” but I just have to answer his question!!! I was the stand-in for Leaf Phoenix and they selected me because they needed someone who was about his height and similar body build…and as I am only 4′-9 (was then, and still am now) and around 95 pounds, I was an ideal choice. Hard to find anyone over 16 years old that fits that description, and with the long hours we had to work, you had to be that age. Thanks, Melanie. We’ll never look at Lorraine Baines McFly the same way again. War Eagle!